The author of a remix on a hit AIN'T NOBODY - Lissat & Voltaxx which became a track of year according to TIGER RECORDS, and got on the 1st line of a chart of 2014 Beatport. A resident of Moscow best night club Pur Pur iBar. Releases so far at well-known world’s labels Milk & Sugar, Tiger Records, Grate Stuff, Pacha Recordings, Erase Records, Urbana Recordings, Prison Entertainment. Winner of the Delphic Games like a "DJ". 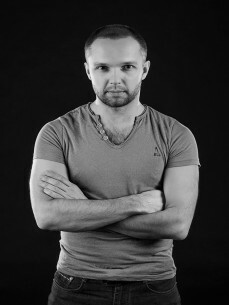 Ranked in the top 5 best DJs of Russia 2015. First place in the hit-parade Radio Energy, Megapolis Fm, You Fm. Single "Rock Dj" was #1 Best Bulgarian radio "Millenium"
Musical director and resident club Pacha Moscow 2011-2013. Over the years, releasing singles and remixes, many of which fall into the charts and became 100% hits worldwide. He received the support of his work on the best world radios and from many world stars :. David Penn, D Ramirez, Syke n Sugarstarr, Jay Lmen, Kolombo, Daniel Fernandes, Loop, Shiba San and many others.